Ice skating always looks such fun, and it’s made to look easy by fearless kids who whizz around as if there’s nothing to it. But in reality, ice skating can be risky, and you need to know what to do to avoid injury when you’re indulging your dreams of being the next Olympic figure skating champion! Whether you’ve never skated in your life, have had a few lessons, or think you’re pretty good, you still need to wear protective equipment. Ice is hard! It’s not only falling yourself that’s a worry, other ice skaters can reach speeds on the ice that make collision and falling as a result potentially dangerous. 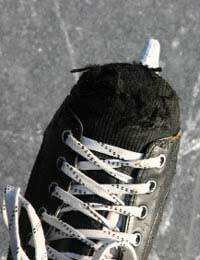 A typical ice skating accident involves falling over backwards, which can mean that the sharp blades on the ice skates can cause painful injury. You’ll need to wear gloves, with elbow and knee protectors and a safety helmet. A standard cycle or even a ski safety helmet will be suitable for the purpose, there’s no need to buy anything specifically for ice skating, as long as your head is properly protected. You also need to make sure that all laces or buckles are fastened securely. Make sure the ice skates fit properly – there shouldn’t be too much room for movement, but at the same time they shouldn’t constrict blood flow The best skates are supportive and don’t let your ankle roll inwards. Getting an ice skate with adequate ankle support is one of the most important things as the more supportive the skate, the more control over the blades there will be. The skate should not feel spongy or too soft on your foot. If you think you’re about to go over, bend your knees and squat down. Let yourself fall to the side and lean forward slightly as you fall onto the ice. Don't lean backwards, as this could lead to hitting your head. Put your hands in your lap and don’t place them on the ice –another might accidentally skate over your fingers! Once you’ve fallen, you should turn onto your hands and knees. Put one of your feet between your hands, and then the other foot Use the toe picks on the skates to stop yourself from sliding. Push yourself up to a standing position.If you are injured, try to get off the ice as quickly as you can, and out of the way of other skaters who could do you more damage than the fall did. Don't stay on the ice! If you want to know the best way to prevent falling over or improve your ice skating skills, try booking lessons before you go away at a local ice skating clubs or ice rink. Artificial ice in rinks is great to learn on as it’s inherently safer - natural ice can be treacherous. If you decide to skate outside, for safety reasons stick to lakes, ponds and rivers where you can see that the ice is deeply frozen and strong enough to skate on. Never venture out ice skating alone.